At Suspension Connection we offer a range of affordable leveling kits designed for your specific truck. These front leveling kits are easy to install, range in size from 1" to 2.5" and start at just $39.95. 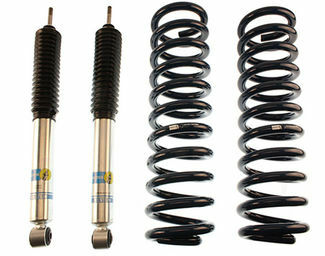 Our selection includes some of the best products from Daystar, Tuff Country, Bilstein and Rancho. Companies that have built their reputation by delivering strong products that last. With our finger on the pulse of your truck and SUV needs, at suspensionconnection.com we offer only the most reliable and effective kits designed to level your vehicle. From Daystar to Tuff Country the goal is to level the front of your vehicle with the rear, without the hassle of a difficult or problematic installation. The term leveling kit is derived from the fact that most trucks are taller in the rear than in the front so the front suspension allows the truck to sit level. Although the main function is to raise the front end to match the height of the rear, they employ other purposes as well, like allowing extra clearance for larger tires and wheels. Tuff Country and Daystar leveling kits are custom to each vehicle make. 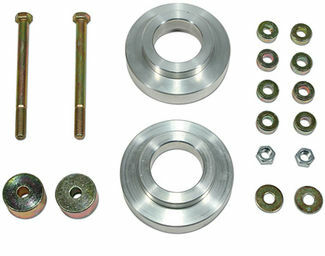 One way of leveling your vehicle is the coil spring spacer leveling kit. Used in many vehicles like the Dodge Ram 1500/2500/3500 and 2wd wheel drive pick ups. By simply inserting coil spring spacers above or below (depending on the application) existing coil springs, you will not only lift the front end of your vehicle, leveling it with the rear but you'll maintain a factory ride without voiding your factory warranty. 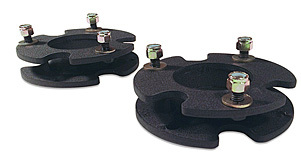 Strut spacers have two different styles. One is a pre-load which will need a compressor to install it onto your coil. The other bolts onto the top of your coil which is a much easier way to install onto your vehicle. The struts are used most on Chevy Silverado 1500's, Ford F-150's and also Toyota Tundra's. The installation on the bolt on style is much easier which requires no disassembling. Another affordable and efficient method is a torsion bar key kit; used in many popular vehicles like the GMC Sierra 2500HD, Ford F150 97-03 and Dodge Ram 1500. These replace your factory keys, providing a lift by resetting your vehicle's torsion bar resulting in a lift. The aftermarket torsion keys we offer are constructed with high quality steel making them more substantial than factory torsion keys to guarantee this is a safe and effective providing long service life, especially under heavy loads. Tuff Country is the originator of the modern leveling kits. All products are made right here in the USA. Using high quality steel and aluminum. 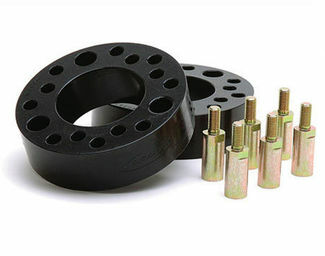 Their spacers are made to maintain the factory ride or near factory ride. Kits are designed to be an easy bolt-on installation. On most kits you will not have to remove the factory strut of your vehicle. Lastly these leveling kits from Tuff Country will have a lifetime warranty. Since 1977 Daystar has been part of the automotive suspension industry , making poly vehicle parts. They have 30 years of experience in the industry making quality products. Most of their products are made polyurethane and are molded directly by Daystar. The quality of their parts are made to exceed their expectations. One of the benefits is these products are developed and forged in USA. They give your ride a better riding stance, good rice, and it just looks nicer overall. Both kits have easy installs. NO welding is required for both of these brands leveling kits. Both use a warranty on their products. (more info about warranty's can be found on both Daystar and Tuff Country's website) Lastly, both companies have over 50 years of experience. You would want to purchase one of these kits if your truck is not level, or to get the front and rear size of the truck the same. If you do that then your vehicle will be able to allow extra clearance for larger wheels and rims. Tuff country and Daystar make a custom fit for every vehicle so it performs to its fullest. The ride quality for both Tuff country products and Daystar products are superb. Daystar products are made from polyurethane which has been said to make the ride quality smoother or keep it same as stock ride not changing anything. Tuff Country products are tested and made sure to give you great ride quality, keep the same ride quality you had before the installation. As far as the installation they both come with instructions and are pretty simple to install. NO welding is needed for both Daystar or Tuff Country leveling kit. Also there is no drilling needed to install these kits. - Off Road: Leveling kits could help you off road. If you have a leveling kit you will be able to get bigger tires installed onto your vehicle, which could help your handling off road, but the over all kit won't do too much to help you off road. - Highway: A leveling kit will not affect highway usage. - Towing: A leveling kit will not affect towing usage. Ford F-150: These popular trucks are easy to level and look great once the kit is installed. 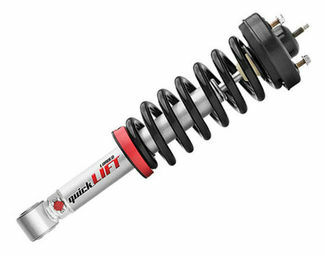 Chevy Silverado 1500: Newer models use an aluminum or poly strut spacer that installs easily. Dodge Ram 2500 4x4: Using coil spring spacers these install while maintaining a factory ride, while not requiring extended shocks. When leveling your vehicle it can give you more space to add some bigger tires onto your truck. With those bigger tires you can add some pretty good looking rims and make your truck look much better than how it came stock. The price of Tuff County and Daystar kits are very competitive in comparison to other leveling kits in the market. It's a great way to upgrade your trucks look in a economical way.